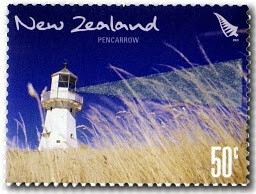 In 2009, NZ Post commemorated the 150th anniversary of New Zealand’s first lighthouse (Pencarrow) with five distinctive stamps. 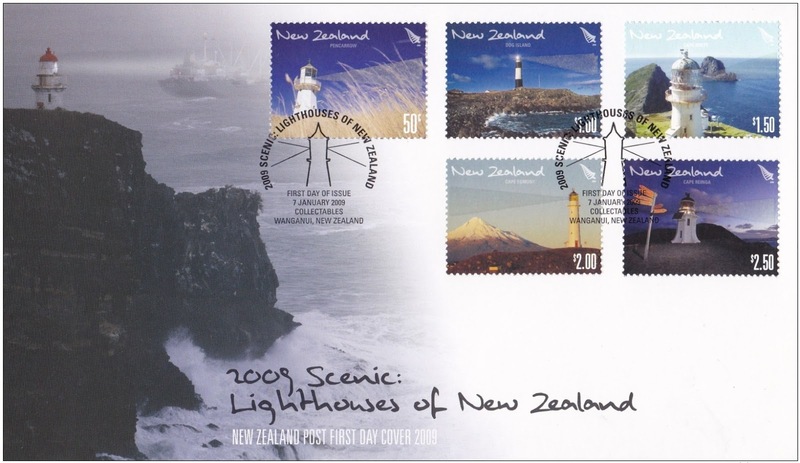 Each stamp featured a technological ‘landmark’ of its own – lighthouse beams that actually glow in the dark! You can see the slightly unusual texture of the lighthouse beams in these stamp images. As true landmarks of New Zealand, lighthouses continue to have an important role for ships entering and leaving New Zealand’s waters, helping sailors to calculate their distances from land and travelling speeds, providing effective warnings of potential danger and signalling entrances to safe harbours. Today, all lighthouses are automated – the last to be converted was The Brothers lighthouse in July 1990. And while few of those built of local hardwood have survived due to the harsh conditions on New Zealand’s coastlines, the lighthouses made of hardier materials such as stone or concrete, continue to perform, decade after decade. Single 50c 'Pencarrow' gummed stamp. New Zealand’s first lighthouse was built at Pencarrow Head in 1858 to illuminate the entrance to Wellington harbour – an urgent requirement given the area’s hazardous coastline. Operated by Mary Jane Bennett (the only woman keeper in the New Zealand Lighthouse Service), the lighthouse remained in service until replaced with an automatic light at Baring Head in 1935. Today, it’s a popular destination for hikers and bikers, and a reminder of the importance of maritime transport to the city’s early settlers. 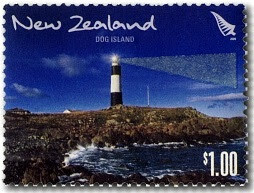 Single $1.00 'Dog Island' gummed stamp. First lit in 1865, the Dog Island lighthouse is located at the eastern approach to Foveaux Strait, which separates the South Island from Stewart Island. The lighthouse marks a low, flat island that rises only a couple of metres above sea level, and is painted in black and white bands so it stands out in daylight. Featuring a lens powered by solar energy, New Zealand’s tallest lighthouse is now monitored by computer from Wellington. Single $1.50 'Cape Brett' gummed stamp. 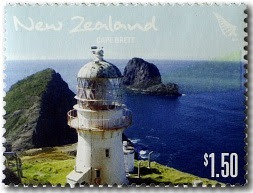 The 14-metre-high Cape Brett lighthouse stands at the entrance to the Bay of Islands. First lit in 1910, it was the heart of an isolated settlement of three identical houses for the keepers and their families. The lighthouse was built locally out of cast iron, then barged to a local beach before being winched up 149 metres and assembled on site. It was the first in New Zealand to feature a rotating light floating on a bed of mercury, which enables a heavy and brighter light that could also rotate faster than its counterparts. 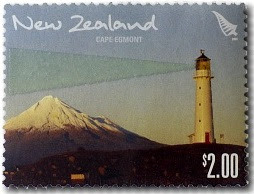 Single $2.00 'Cape Egmont' gummed stamp. The cast iron tower on the Cape Egmont lighthouse – which sits on the westernmost point of Taranaki – was built in the mid-1800s in Pimlico, London. The segments were shipped to New Zealand in 1865 and assembled on Mana Island north of Wellington. However, this was often confused with the Pencarrow light, and in 1872 and 1874, two ships confused the Mana light for Pencarrow, and both ships were wrecked, so the tower and lantern were shipped to Cape Egmont in 1881. It was electrified in 1951 and in 1986 became fully automated. 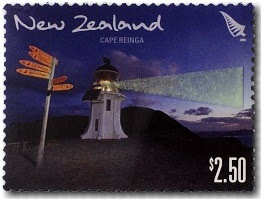 Single $2.50 'Cape Reinga' gummed stamp. Built in 1941, the Cape Reinga lighthouse was the last manned lighthouse constructed in New Zealand. Today, it’s our most well known and most visited, easily found at the end of the road at the northernmost tip of New Zealand. The lighthouse replaced one located on nearby Motuopao Island (built in 1879) and was powered by diesel-generated electricity. Now automated and managed by computer from Wellington, it’s often the first light in New Zealand that sailors see. This location is also significant to Māori, known as Te Rerenga Wairua (The departing place of the spirits), this is the point in which Māori spirits depart, before starting the ancestral journey back to the homelands of Hawaiki. First Day Cover - 7 January 2009. These stamps remained on sale until 6 January 2010.